Construction of guest house, machine shop and other buildings, including 40 cm telescope building, is completed. 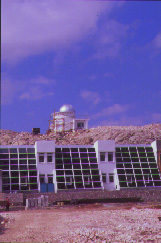 Construction of the tower and the building for the 1.5 m telescope started on July 1996 and finalized on summer 1998. 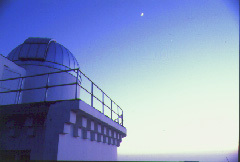 40 cm telescope installed on August 1996 in a tower with 4.5 m dome ( Ash-Dome ). 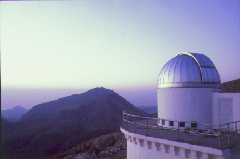 1.5 m telescope have 10.5 m double skin dome (Observa.Dome ). Final assembly of 1.5 m telescope started on May-June 1997. First light was observed on August 3rd 1999. Cross sectional view of 1.5 m telescope building shows coude room and the optic path. Fig.1 , Fig.2 show, south and north view. Fig.3 , Fig.4 and Fig.5 are plans for basement, coude and telescope room layouts. In spring-summer season, all mechanical parts are installed. Control room for telescope drives in the basement completed. Balance adjustments for all secondary mirror configurations are done and primary mirror is installed. Course adjustments for pointing and tracking tested. The last step will be the final fine adjustments for pointing and test observations for astronomical fine tuning. 25/7/97: Final adjustments !! of the dome and operation of the shutters. 24/7/97: Installation of the dome on top of the building with the team. 19-23/7/97: Installation of hour axis, fork and tube on the support structure with in an error limit +/- 2 minutes. 5-10/6/97: Transport of heaviest parts of the 1.5 m telescope and the containers of the dome to the site from Antalya. 23-27/5/97: Observations for north alignment and installation of the support structure over the pillar. 40 cm calibration observations started. 1.5 m telescope dome (Observa.Dome) has been received and stored in Akdeniz University Campus area. Construction of the pillar and the coude room is completed. All steel parts of the building are installed. The plan for transport of the heaviest parts of the 1.5 m telescope (base and fork) with helicopters failed due to two technical problems: 16.5 tons of base is too heavy to carry upto 2500 m high due to low air density. In case of unstability conditions during the transport, pilots of the helicopters have right to leave the cargo for free fall !! in order to save their helicopters. Now we returned to our initial plan of transport by trucks. 40 cm telescope dome installation completed and the telescope is installed. Callibration observations will start soon. Production of the 1.5 m telescope dome (Observa.Dome) has been completed. Acceptance testing by TUG has been performed in the factory. Dome disassembled cleaned and painted; and loaded to containers for shipment. Containers will be shipped to Antalya on Sep. 16. We expect the dome on site by Oct. 15. Installation will start as soon as the dome arrives. Construction of the pillar and the coude room is going. All steel parts are fabricated and transported to the site; ready for installation and witing for hard enough concrete base. Flat 20x20 m space for the work area is ready near the building. Technical problems for the transport of the heaviest parts of the 1.5 m telescope (16.5 tons of base and 6.5 tons of fork) seems to be solved. They are planned to be transported by helicopters of Turkish Air Forces. We hope to transport those in October 96. Work on first cassegrain instrument "Imaging CCD" is going and will be ordered in a few months time. Some auxillary instruments like GPS and timing station etc. have been ordered. The guest house and machine shop completed. 40 cm telescope building completed and dome installation will be completed this week. Telescope installation will start on late August. Excavation for 1.5 m telescope is completed, construction of the pillar and the coude room is proceeding on the flat top area. Production of the steel parts of the building is proceeding and will be transported to the site after testing the production defects. 10.5 m dome will be ready for acceptance testing in late august. After tests the dome will be transported to the site.